Where would BNWF be without the instructors who teach, and support us? We love our BNWF’s instructors and I know you do too. They make fitness fun, and help you reach your goals. Monique Leary the is our spotlight instructor for the month.. She brings the heat, intensifying dance/cardio and you always go away knowing you were lit. BNWF Spotlight is on Monique Leary who loves helping people have fun while they workout! She has been a BNWF instructor since 2016 . What is your favorite song to get the class hyped? My favorite song to get the class hyped would be “Booty” by Blac Youngsta…it is a class FAVE. My favorite fitness class is MixxedFit on Tuesday nights. My favorite healthy meal is grilled salmon with red russet potatoes and asparagus. My favorite cheat meal is? My favorite cheat meal is oxtail, rice and peas with EXTRA gravy, cabbage and sweet plantains. Something not many people would know about me is that I love scrapbooking. My first specialty class on Mondays is Caribbean Beatz. I am an island girl and enjoy listening to music from the Caribbean Islands. I love sharing the different rhythms and dance moves with my class in which they have grown to love and appreciate as well. My second specialty class on Tuesdays is MixxedFit. MixxedFit is a people-inspired fitness program that is a combination of dance and boot camp exercises to today’s hits plus yesterday’s favorites. All moves are repetitive and easy to follow. My goal for my members is to have them leaving my classes feeling full of life from a great full body workout without any judgment. For one hour, they get to be a free spirit, put their worries and troubles aside and have as much fun as they possibly can. They also know that they can come to me outside of class for help with nutrition and weight loss. What inspires you? Why does she love BNWF ? Being challenged inspires me. I’m known to not do the ordinary! I’m inspired by the exertion, creativity, and sacrifice needed to exceed what I think is possible!! I love BNWF because this gym allows me to DO ME and give our members what they want. After all, it is their workout and if I can’t give them what they want…they will find another gym that will. Hiking up trails, karaoke, rollerskating, pole dancing, sip and paint. 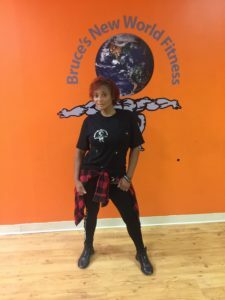 Thanks for telling us about yourself Monique, and being a huge part of the Bruce’s New World Fitness Family! Have you been to one of Monique’s classes ? Make sure to check her out on Mondays and Tuesdays at 7pm. MONIQUE aka hot peppaseed is an AWESOME instructor! I’m so excited to see her celebrated for her craft. Congrats Mo!! Monique is awesome I started out at bnmf with her on a Monday night and she made the classes so much fun that I found myself coming back on Tuesday night Wednesday night Thursday night and Saturday morning.